Home » Brilliance Magazine » Bring your Offer to the Table! 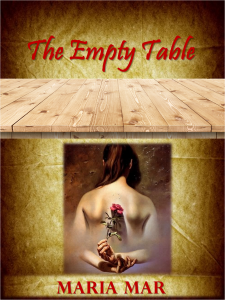 For years I had been writing poems, but for some hidden reason I never published them. Poetry was the first form I used in my writings. I’ve been writing poetry since I grabbed a pen for the first time. But for some unknown reason, I published fiction, then non-fiction and even created dozens of products… and yet my poetry was unpublished. as a woman to brings my gifts to the table! That’s when I created my Artchemy Atelier. 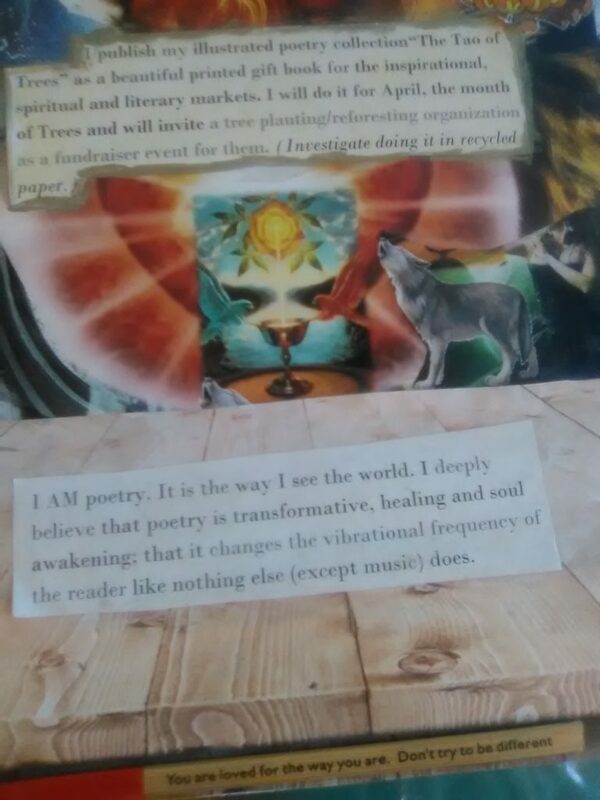 Using my trademark Artchemy(tm) process I created a Manifestation Tableau that brought my poetry book into the solid reality as a tangible, visible reality. 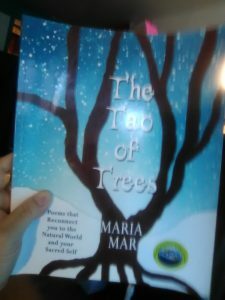 I cooked my book in the Manifestation Tableau using the power of fire, air, earth and waters… and by the next year, my first poetry book, The Tao of Trees, was published. DONE! Here’s the poetry book in my hands! Or you give your time and energy to others, to your duty, your job, and that gift, that book, that creation, that offer keeps moving farther and farther away, receding in the tides of time! Whatever it is that hold you back or makes you procrastinate, the result is that weeks… months… years go by without you crafting that offer, finishing that book, launching that project. And the more you stay in your Comfort Zone, the more stagnant your energy becomes, the more doubts you pile up as a mountain between your dream and you and the more your dissatisfaction grows as your confidence diminishes. And then the frustration, guilt and pain take over as you realize that you are not embodying your spiritual purpose, not sharing your gifts, not doing what you came here to do. But you can take the scary edge off by PLAYING with your creation. Bring fun, creativity and exploration into the process… and it goes from a torture to a playground. As a result of this challenge I have developed a creative path to go from procrastination to creation using fun arts and crafts and other creative activities that soften the scary edge of unveiling your offer. 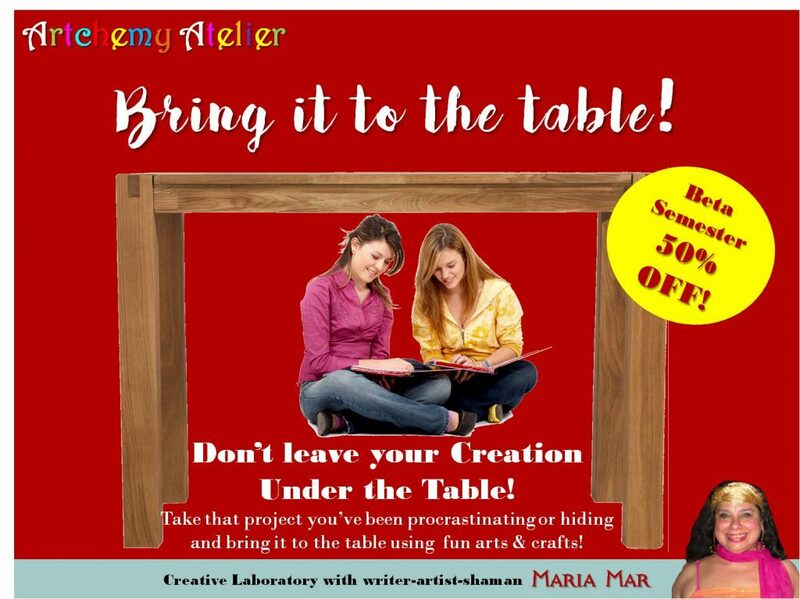 If you have a book, program, service, product or even a rebranding that is past its time, then join me in my virtual Artchemy Atelier for a private laboratory to get that thing done this year! Don’t leave your Creation Under the Table! Take that project you’ve been procrastinating or hiding and bring it to the table using fun arts and crafts! Discover the creative power and wisdom buried under your fear or doubts, so that you open the flow of your creative genius. Transform what is holding you back into the creation that moves you forward. Limited time offer. Limited seats available.